Considered a “must have” piece of commercial restaurant equipment, food processors came on the scene in the early 1960s. The first food processor was introduced by Robot Coupe (say Ro-Bo-Koo). Robot Coupe is still a Best in Class food processor manufacturer today and sold by Burkett Restaurant Equipment. The food processor has virtually eliminated most labor intensive tasks in the kitchen and has cut down on food preparation time. Chopping, mincing, grinding, pureeing, slicing and shredding are all made easier with a food processor, in commercial and home kitchens. A food processor is an electrical appliance that is made up of a mixing bowl and a range of blades and disks. All food processors are required to have safety features that only allow the machine to start processing once the bowl and lid are locked. Generally speaking, food processors come with two types of blades: s-shaped stainless steel blades and plastic blades. Stainless steel blades fit at the bottom of the bowl and chop, shred and grate vegetables and meat. The plastic blade is great for mixing bread and pizza dough. What Should You Look for in a Food Processor? Look for a powerful food processor that can process food quickly and consistently. A heavy chassis will keep the food processor from “walking” during heavy-duty processing tasks. A large bowl capacity, at least 2.5-3.0 quarts. Keep in mind, if you are processing liquid ingredients, the bowl capacity is just about cut in half. A wide feed tube. A wider tube lets you push larger pieces of food through while processing. Simple controls. Many models offer a wide array of speeds, but make sure you have a Pulse option, which is great for making bread and pizza dough without over mixing. Bonus features like a citrus press for juicing oranges, limes and lemons; or an egg whip that can be used during baking. Ready to shop? Take a look at our selection of New and Used foodservice equipment and supplies! Shaft Size… The type of Immersion Blender you will need depends on how you will be using it. Since shaft sizes range from 7″ to 21″, and capacities range from 3 to 50 gallons you’ll definitely the right product to fit your needs. So how do you determine what you need? This depends on the size and quantity of what your mixing and the container or pot that you will be using for mixing. Let’s say you plan on making Cheddar Broccoli Soup with an Immersion Blender and you will make 5 Gallons of soup each time you prepare it. Using a 24 Qt Aluminum Stock Pot that is approximately 12″ tall, you would need a Waring 12″ Immersion Blender for precise blending. However, we recommend that you select an Immersion Blender with a shaft 4-6″ longer than your pot because as your business grows you will be making more soup in larger batches. This will require a longer shaft Immersion Blender. Keeping this advice in mind, we recommend that you use a Robot Coupe 16″ Immersion Blender. With that said, as the size of the shaft increases so does the price of the Immersion Blender so take this into consideration as well. Power…. You also want to consider the amount of power that the Immersion Blender will need to properly blend the mixture. If you will be using the chopping attachment, it wil be necessary to have a higher power Immersion Blender to ensure a thorough chopping. Immersion Blenders with a 600 or more wattage, are ideal for heavy use in restaurants, while a 200 watt product will suffice for blending small batches of smoothies and sauces. mixtures. A stainless steel material, while more expensive, will easily clean and some are dishwasher safe. Warranty…. Does the Immersion Blender offer a good consumer-friendly warranty? Hassle-Free Warranties are highly desired by consumers because the warranty claim process is ideal when you use the product regularly and cannot wait to have it serviced. Keep in mind that no warranty will cover misuse and abuse so make sure to read and follow the Instruction Manual provided with the product. Read Yesterday’s Blog for more information. Would you buy a car without a warranty? Of course not and you shouldn’t purchase equipment without a warranty. But it is not enough that it has a warranty, you need to understand the warranty and what it includes and does not include. receive the form, they will send you a new Immersion Blender and return labeling to return your defunct machine. In the event that the second one malfunctions, you will need to send the item in for repair. When you contact Robot Coupe, make sure you have the serial number or send in proof of purchase (receipt). Recently, Jeff Hussar, Burkett Sales Consultant had a customer who’s Robot Coupe MP550 Immersion Blender stopped properly blending ingredients after only 7 months of moderate usage. The customer contacted the manufacturer and a new one was quickly shipped to her. It was that simple. If you need assistance with an Immersion Blender Warranty issue please contact a Burkett Customer Service Representative at 1-800-828-8564. An Immersion Blender is definitely not hard to use. With that said, we’ve dealt with our fair share of Immersion Blender malfunctions that could have been easily avoided. Immersion blenders are priceless pieces in a kitchen and it is worth while investing in a good unit that with proper usage, will last. The most common problem we see is people who use a “butter churning” method (up and down) when using an immersion blender which actually ruins the motor and significantly reduces the RPM. The immersion blenders need to be put in the pot or mixing bowl at a 45 degree angle not straight down. The reason for this is that the blades act by pushing air into the product and rotating it through the blades which emulsifies the product. The “Butter Churning Method” will make even the most prestigious Immersion Blender fail within the first 20 seconds of use because it is unable to acquire enough air to push through the blades causing damage to the motor. You will only get up to a 6 month use of the Immersion Blender using the “Butter Churning Method,” where as you will get a couple years of use out of it when using it properly. One last but important tip is to allow the mixture you are blending to cool slightly depending on the material of the shaft. There are lots of deliciuos foods that you can make with an Immersion Blender. One of my favorites is hummus. For those of you have made it before, you know how messy making hummus in a standard Food Processor can be. Having to scrape the processor bowl and the blade can be a real pain. Simplify the process with an Immersion Blender. You can make the recipe in a Cambro 4 Qt Round Container and then store it in the refrigerator, minimizing the cleaning process. Your customers will love this spin on the traditional hummus recipe. To Roast Red Peppers: Preheat oven to 500 degrees. Place Peppers on a baking pan and roast for 45 minutes, turning occasionally. Remove. When cool, cut off stem and burnt skin. Place chickpeas, red peppers, lemon juice, tahini, garlic, cumin, cayenne, and salt in a 4 Qt Cambro Container. With a Robot Coupe Turbo 14″ Immersion Blender, blend ingredientsuntil smooth, scraping side of container. Place lid on container and refrigerate for at least 1 hour. Return to room temperature before serving. Sprinkle hummus with chopped parsley and paprika before serving. When shopping for a commercial Immersion Blender, Waring and Robot Coupe offer a superb product at a great value. To make it easier for you to decide, we’ve broken down what each vendor has to offer. you didn’t know that they were also the first company to develop a miniature blender for consumer use in the 1930s! By 1954, Waring had sold over 1,000,000 blenders! Yes with their long history in the commercial equipment industry you can rest assured that you are purchasing a well constructed product. From the versatile Quik Stik® to the heavy-duty 1 HP Big Stix®, these handheld blenders easily power through any task that requires ingredients to be blended, mixed, whisked, puréed or whipped. Shaft sizes range from 7″ to 21″, and capacities range from 3 to 50 gallons. With all-purpose stainless steel blades that reach deep, and comfortable grips, users can count on ultimate control and consistently smooth results. Waring Immersion Blenders are relatively affordable when compared to other vendors. For example, a basic 7″ 100 Watt Immersion Blender is only $49.99. A higher capacity 21″ 750 Watt Immersion Blender is $481.50. All Waring Blenders also come with a 1 Year Limited Warranty. Waring also offers a several accessories and attachments that make the Immersion Blender even more versatile in a restaurants kitchen. Another excellent choice when purchasing an Immersion Blender is Robot Coupe. Robot Coupe has been the foodservice industry leader in the development and refinement of commercial food processors and vegetable preparation units for over 30 years. Recently Robot Coupe was named “Best in Class” in the food processor category by an independent panel of industry equipment dealers, broadliners, and consultants. [a] variable speed function will enable you to adjust the speed to suit each preparation and to start the processing at a lower speed in order to reduce splashing. 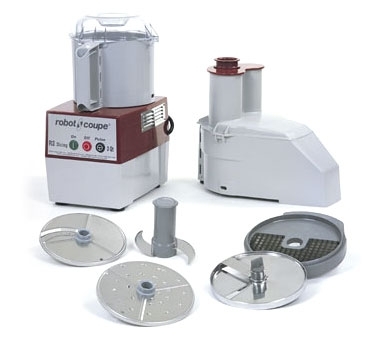 Exclusive to Robot Coupe, their Immersion Blenders have all stainless steel removable blade, bell, and shaft which makes for easy cleaning, as well as an automatic speed regulating system. A 1 Year Replacement Parts Warranty comes standard. Keep in mind of course, high quality manufacturing requires a higher price tag. The Robot Coupe MP550 21″ 840 Watt Immersion Blender costs $929.90. The lightweight 8″ 220 Watt Immersion Blender retails for $279.65. Like Waring, a variety of accessories are also available.